While routine drain cleaning is a common everyday problem, there are other more serious flow restriction difficulties, which can rarely be solved by any of the equipment options already mentioned. Buildup of cast iron pipe scale, lime (calcium carbonate), concrete, grout, barnacles, and struvite are examples. Others include removal of delaminated orangeburg/fiber liners in cable ducts and mineral deposit buildups at pipe joints. For effective and timely descaling in these circumstances, it is necessary to use higher pressures and flows. 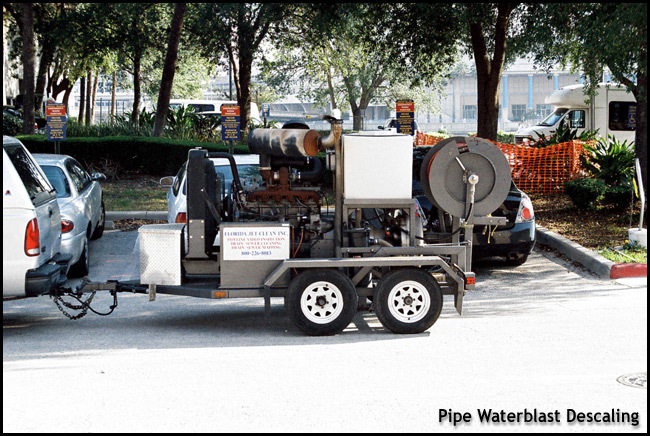 Pipeline waterblast descaling is best carried out via rotary descaling nozzles at pressures up to 10,000 psi and flows of up to 34gpm. 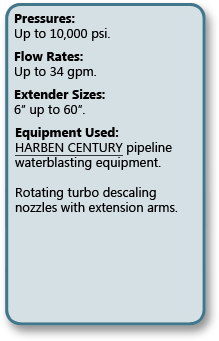 By using extender arms on the nozzle, diameters from 6” up to 60”, larger pipes can also be successfully descaled.